Yep. Don’t get me wrong, we taught our kids to say “please” and “thank you.” Except it didn’t stick. We taught our kids that interrupting, yelling, and fighting is wrong. They still did it. At the table, we emphasized serving others first, chewing with your mouth closed, and sitting straight. But they didn’t. The reality is that teaching good manners to kids is hard. It’s not simply a matter of telling them to do certain things and not do other things; you have to train them. As parents, I don’t think we understood that right away (we had to be trained ourselves, haha). Training involves repetition. How many times does a gymnast stretch? How many miles are run, day after day, before a track meet victory? How many stitches go into a quilt, how many hours at the batting cage before the game-winning home run, how many years of study and practice before a successful surgery? The answer: lots. And lots. And lots. And our kids are getting it. They’re not perfect, but they are improving. They can speak to adults, answer questions, say please and thank you, respectfully sit through church and small groups, help with the dishes, and earn high marks for classroom behavior. So don’t be discouraged when your kids don’t turn into little angels the first time you go over the good manners chart. It will take time, practice, explanation, repetition, more repetition, more repetition, more explanation, more practice, and even more time. Then you’ll just cycle through and do it all again. But you’ll get there! There’s a reason children don’t grow up overnight. Raising kids and teaching them proper behavior takes time. But the results will be well worth it. Here’s what we have in store for you. So let’s just get right to it. 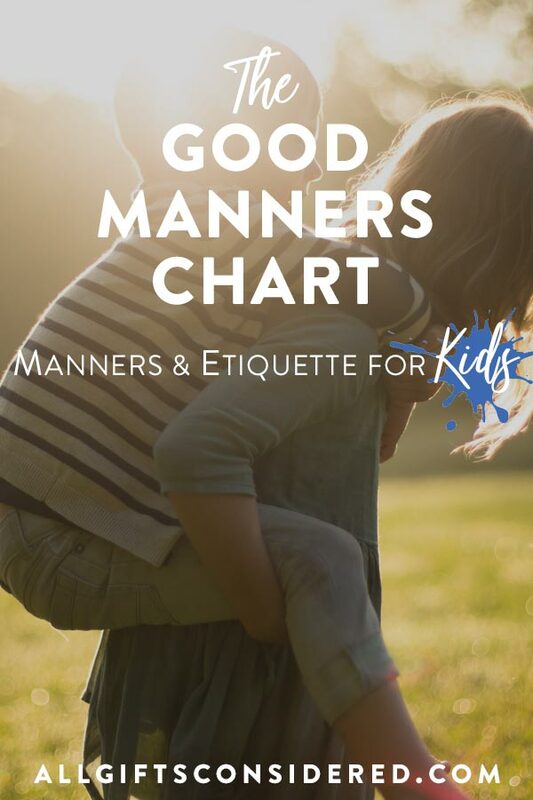 Here is the good manners chart, which details 10 basic manners and the reasons why they are important, plus 10 table manners and 10 manners to practice at school. Read further to get a free download/printable version (which has much nicer formatting). Also keep reading for explanation of the hows and whys so you can be prepared to teach your kids these must-know manners. Everything is explained in detail in the article below. If you skim the article and think “ugh, TL;DR” then just grab this good manners chart, print it out, and start working through it with your kids. 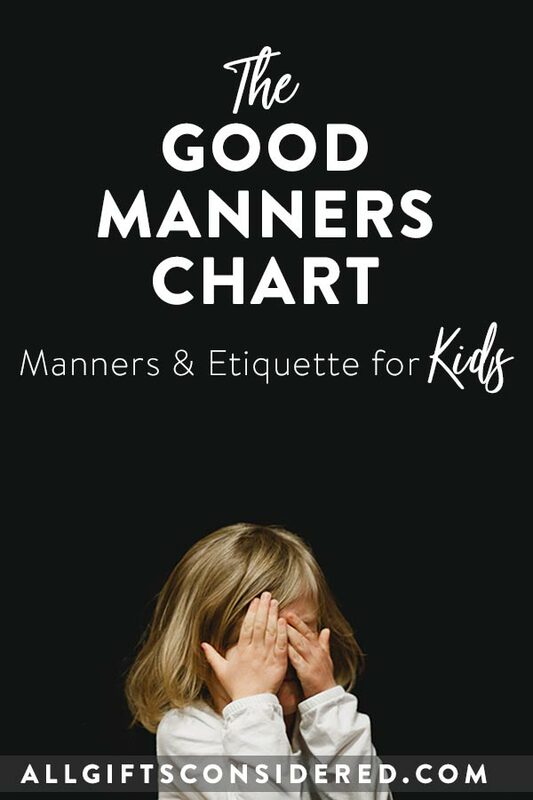 In the good manners chart we detail some of the most important basic manners, plus table manners and manners at school. In the article below you’ll find deeper insight on each manner and why it is important in how you treat others. We also have sections on cell phone (e.g. electronics) etiquette and a list of bad manners to avoid. All this will help you find creative ways to teach manners, along with the reasons why we practice good manners: It comes down to to showing love and respect to others. polite behavior that shows other people respect, courtesy, and kindness. A good definition of manners for kids is knowing how to treat people well at all times. 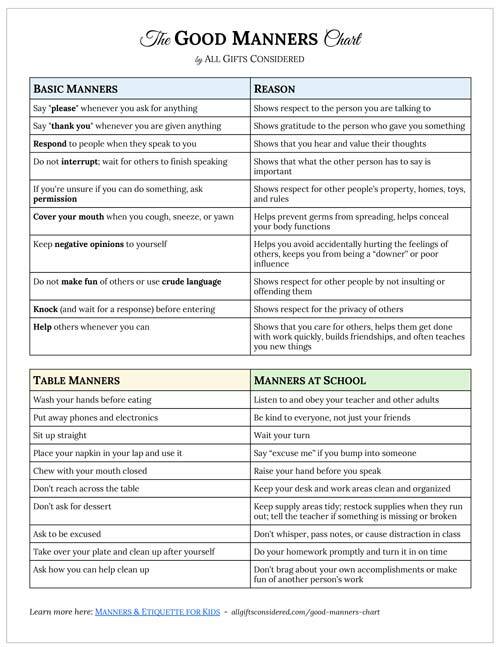 See the Good Manners Chart download for simple, basic reasons why these manners matter. When you can clearly and simply show why manners are important, it helps kids to understand and take ownership of their behavior. Everyone’s hands get dirty throughout the day. The last thing you want to do is bring dirt, grime, and germs to a place where people will be eating – yourself included! Since the quickest way to get sick is by putting germy, icky stuff into your mouth, you are treating yourself and others with kindness when you wash your hands before a meal. Go to the nearest bathroom (often the kitchen sink will be in use by the cook or at least by dirty dishes) and wash your hands for 15-30 seconds using hand soap. Dry off well and then come promptly to the dinner table. 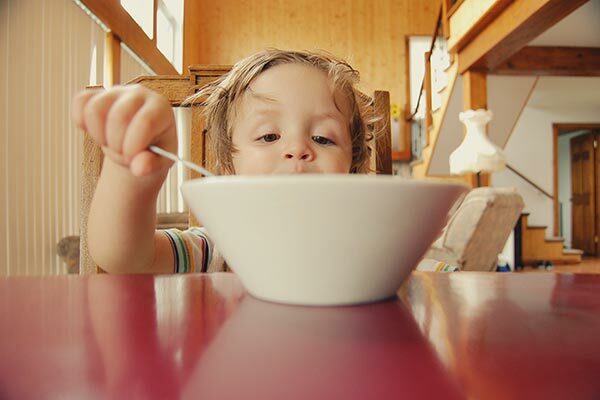 At mealtimes, you should silence and put away all electronic devices. And because phones still buzz and vibrate when silenced, it is ideal to place cell phones and other devices away from the table. If you are in your own home, set up a location to put devices. If you are a guest, you can put your phone in your pocket but it may be better to put it in a jacket pocket or purse hung up on a coat rack. When our family goes anywhere my children almost always bring a little backpack or handbag with notebooks, crafts, and small toys. This would be a good location for electronic devices. Personally, we don’t allow our kids to bring any sort of electronics to other people’s homes. Exceptions are when you are expecting a call, or when parents have requested that the child be available to contact. If this is the case, tell the adults at the table that you are expecting a call and then excuse yourself from the table when it comes. Cell phones and other electronics have become a major part of our lives, so we will have a more complete section on cell phone etiquette later on as well. See below. Sitting up straight in your chair looks better than slouching. When you sit up, not only do you put on a better and more attractive appearance, but you also show interest in what is happening around you. You are ready to partake of the food and the conversation. In contrast, a slouching person seems tired, sad, uninterested and uninteresting. When you are bent over in your seat, you communicate to those around you that the food is unappetizing and your fellow diners and boring. So show respect and kindness to the person who prepared the meal and to the rest of the family by sitting up straight. This is also the same reason you should not put your elbows on the table. When you place your napkin in your lap, it helps to catch any crumbs that may fall into your lap. It is also out-of-the-way from all the food on the table, and easy for you to grab and use if needed. And you probably will need it. That’s perfectly fine; it’s better to use your napkin than have a food-stained chin or cheek. To use, gently dab wherever needed. Dabbing (no, not that kind!) is a more genteel and sophisticated movement than wiping. You should avoid wiping across your face. No one wants to see your food as it is being chewed. Keep you mouth closed when eating. This will also help you make less “smacking” sounds when chewing your food. When you reach across the table, it makes you appear greedy, needy, and impatient. Plus you run the risk of knocking things over, spilling, draping your clothing into food, or dropping hairs and crumbs onto the table. So never reach across the table. Instead, politely ask for things to be passed to you. Dessert is my favorite part of the meal, too! But don’t worry – if there is dessert, it will be offered at the appropriate time. It is impolite to simply get up and walk away from the table. Instead, ask your parents if you can be excused from the table. If they say no, stay around and learn to enjoy talking with the rest of the family. You used the plate, and you made it dirty. The very least you can do to help those responsible for cleaning up is to take the plate into the kitchen. If you are in someone else’s home, ask where to put your plate. By doing so, you show respect to those who prepared and those who clean up after the meal by being willing to help out, even in this small way. It is a very polite gesture. Again, since you got to eat because of all the cooking mess that was made, it is polite to offer to help clean up afterwards. Don’t say “Do I have to help with anything?” That makes it sound like a chore and a burden. Instead, say, “How can I help clean up?” Saying it this way shows that you are truly grateful for the meal, and are willing to show your thankfulness by helping. The teacher, helpers, secretaries, lunch servers, and other adults at the school are there to help you learn and grow as person. They care for you, and are in charge for a reason. So show respect and kindness to your teacher and other adults in authority over you by listening to them. Listen to them respectfully, answer when spoken to, and then make sure you do what they say. This is not only good manners but also the best way to get learn while you are at school. It’s tempting to just hang out with your friends. You like them, you talk to them, you have inside jokes and clubs and secret handshakes, all that fun stuff. While there is nothing wrong with having close friends, it is still impolite to purposefully exclude others, turn your back on them, whisper in front of others, and ignore the other kids. When you do these things it shows that you like certain people and not others. It’s a form of favoritism, and it’s rude. Instead, go out of your way to show kindness to everyone. Include other children in your games and clubs. Invite the new kid to sit by you at lunch or to do a project with you. Who knows, maybe you’ll make a new friend! It is very rude and impolite to cut in front of others. The other people in line or who raised their hand first have been waiting longer than you. It won’t hurt you any to wait for a few minutes, and it shows that the others who are in line are just as important as anyone else. Waiting your turn is a way to show respect to your classmates and help promote order for your teacher and the other adults. School can be a busy place. There’s people everywhere, lots of classmates buzzing around your classroom, halls and assemblies and lunch lines. Do your best to avoid bumping into people by paying attention and keeping your hands to yourself. Don’t swing your arms around or break dance in a busy hallway, and respect the rules for hallways, lunch lines, and other areas. If you do accidentally touch or bump into someone, look at them and say “excuse me.” If you knock someone over, be sure to apologize and help them up. In a room full of students, this is the best way to make sure you do not interrupt others and wait your turn. 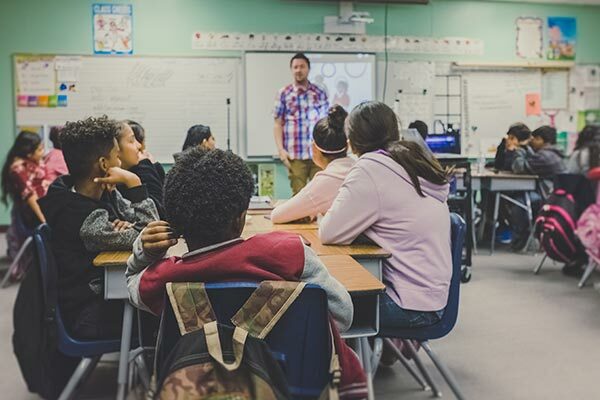 The teacher can’t call on every student every time, and it is not fair for one student to shout out all the answers or try to take over the topic of conversation. So you are helping maintain order and respecting the other students (as well as the teacher) when you raise your hand and wait to be called upon before speaking. When you keep your area clean and organized, you are practicing self-control. You will be able to do many good things (and avoid many bad things) if you can learn self-control. Additionally, when you keep a tidy desk, table, cubby, shelf, or drawer, you show kindness to your teacher and the other students by helping keep the classroom clean and looking good. This is a way that you can be helpful and considerate towards others. When you keep the supply areas clean, tidy, and organized, you help the other students in completing their projects. And when you restock things that run out and don’t make a mess, you help the teacher avoid one more of their many tasks and responsibilities. This means don’t whisper or pass notes while instruction is happening; don’t draw attention to yourself unless you are asking a question or in need help; refrain from humming or tapping during tests or reading time; don’t talk to your friends when others are working on a project. If you are assigned homework, make sure that you work on it right away at home so that you are able to turn it in on time. Tell your parents when you have work to do or homework due, and ask them for a quiet space and/or help if you need it. It’s very important that you return your homework to your teacher when it is due. This will help you with learning what you need to learn, and it is also good manners because it helps your teacher to review and grade it on schedule. It is impolite to always focus attention on yourself. Don’t brag; meaning, don’t tell the whole class every time you ace a test, get top marks, or otherwise succeed at something. This goes back to point #8, “Don’t Cause Distractions.” When you do this, you are showing honor to yourself rather than trying to respect others. Instead, focus attention on others. Praise when they do well, encourage them when they are having difficulty, and help them when needed. On the flip side, don’t make fun of or “mock” the work of your classmates. Perhaps you are very good at art and another student is not, or maybe you are a fast reader and another student is still learning their letters. Or maybe you just feel like another child is a dweeb. Whatever the reason, if you make fun of the way someone else looks, acts, or talks then you are not showing them kindness and respect. Here are some examples of bad manners that you should avoid. For parents, this list can actually be a surprisingly effective teaching tool (in moderation). Set aside a few times where you teach proper manners by modeling (or having your kids model) these poor behaviors. They will have a blast pretending to be bad, and in doing so will learn what is appropriate and what is inappropriate. Bookmark (or Pin) this page as a reference for more explanation beyond what can be included in the single-page printable. It’s important to review! Save this resource to your family/parenting Pinterest boards!